The FIB Buffalo (simply named FIB in Grand Theft Auto V) is a Bravado Buffalo sports sedan modified as a federal chase vehicle by the FIB in Grand Theft Auto IV and Grand Theft Auto V.
The FIB Buffalo is based on the current generation Dodge Charger Police Package, and as with most cars some things have been changed and rearranged. Most noticeably the taillights, headlights and rear license plate have been changed; also the front fascia has some subtle similarities to the 2005—2009 Ford Mustang. Despite the fact there are advertisements of the Buffalo around the city, the civilian version of the car is not available in both GTA IV and The Lost and Damned. However, The Ballad of Gay Tony features both a civilian Buffalo and a Police Buffalo. 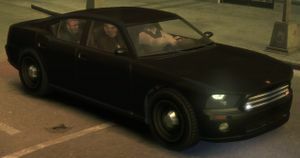 As with most police vehicles in GTA IV, The FIB Buffalo's computer system has full access to the LCPD database, allowing the player to use the car for the Most Wanted and Vigilante side-missions. As with any other public safety vehicle, the player cannot listen to civilian radio stations, take the vehicle to a Pay 'n' Spray or car wash, or complete missions which involve meeting with criminals. The FIB Buffalo is only seen in specific missions (see #Prominent appearances in missions), or when the player attains a wanted level of at least four stars or activates a cheat code (see #Locations). The FIB Buffalo is equipped with a supercharged 6-cylinder engine (possibly a V6) mated to a 4 speed gearbox that provides good acceleration and a top speed of 177 mph (285 km/h). The Buffalo is not as tough as might be expected from its appearance or name, as it has a flimsy construction and is highly susceptible to firearm attack; a possible reason being the car is required to go fast, and as a result has a light chassis. While significantly speedy, the car's overpowered engine tends to result in the car constantly skidding after executing sharp cornering. Standard red and blue emergency lights at the front and rear of an FIB Buffalo. The FIB Buffalo has two sets of blue and red emergency lights (one set in the front grill, the other in the rear windshield), whilst LCPD cars use white and red. Red and blue are illegal for use as emergency car colors in Liberty State (New York State, this explains why LCPD/NYPD cars have red and white lights); it can be deduced that because the FIB Buffalo is a federal car, it is exempt from the state's laws. In The Lost and Damned, the FIB Buffalo is the vehicle of choice for corrupt LCPD officers Ed McCornish and Jimmy Matthews during "Bad Cop Drop", which is clearly unusual as a federal vehicle is being used by members of a police department. However, when ambushed, they are found to be accompanied by the FIB. Equally unusual is the note that all other undercover police units seen in GTA IV and the expansions also use the Buffalo, which, it being a federal vehicle and also a rather highly priced vehicle, would be extremely unlikely. The FIB Buffalo has a unique horn. However, it shares its horn with the Police Buffalo from The Ballad of Gay Tony multiplayer, making it unique no more. The FIB Buffalo in GTA V shares its in-game name ("FIB") with the FIB SUV. Similar to the FBI vehicles from previous games, the FIB Buffalo is somewhat difficult to obtain, as it has no designated spawning locations, and only appears in certain missions or when the player has at least a 4-star wanted level. This is further made harder by the chance of the NOOSE coming after the player instead of the FIB. An easy way to obtain one is to go to the littlelacysurprisepageant.com page on the Algonquin safehouse computer and then wait until they send an FIB team. If they send a NOOSE team, reload the game and try again. When they send an FIB team, just exit the house, kill the enforcers, and park it. An FIB Buffalo can also be spawned via a cheat code by dialing (227)-555-0100 on the player's phone. This works in both GTA IV and its DLCs. If the player drives one around the Bohan Safehouse, several may spawn. A pair will sometimes spawn near one of the satellite dishes in Blaine County between 10:00 and 11:00. Spawning seems to be random, though, as it may spawn alongside one FIB SUV or two FIB SUVs may spawn instead. Special Agent Car, GTA 2 equivalent. This page was last modified on 11 April 2015, at 01:41.